It seems fall is getting a tad soft this year with a gorgeous velvet touch. This fabric is irresistible and adds just the right amount of sophistication to an already great look. With these plummeting chilly temperatures coming in, it pays to have a cosy and luxurious chic fabric known as velvet, to keep you warm and stylish. Although it has been deemed tacky the past few years, in 2016 it has become one of the hottest trends this fall and winter. What comes to mind when we think about velvet? How can I pull this off without looking like an 8-year-old on Christmas morning? Stick with a richer tone this way you don’t end up looking ridiculous. The most common thread running through this season’s shows was rapidly velvet. From Givenchy, Gucci, Chanel, and Prada, these designers made a huge mark in tapping into the winter trend. A lot of different colours are emerging this season, this made us all want to try out this fabric and experiment with our own style. Both high-end and high street brands have dished up this party season style, in a spontaneous palate that allows you to wear this tone for any occasion day or night. There are multiple styles to suit anyone’s taste even if you are a bit nervous to venture out. Here are 5 ways to work this trend into your wardrobe. 1) So Suited- Perfect for the events season, a velvet suit can give off a touch of glamour without resorting to wearing a traditional dress. Pair it with some gorgeous pumps for cocktail hour, or be daring in some stylish loafers. 2) Dress you up- The little black dress can be a staple in every woman’s wardrobe. When it comes to stepping out of tradition, try a velvet dress. This can be worn casual or dressy depending on the length. If you are heading to a dinner event or even a wedding, try a longer length for an old Hollywood starlet look. When shopping during the day with a casual attitude, make the length of the dress shorter. This way it comes off relaxed and fun. Tone down on accessories so the fabric can be centre stage. 3) Menswear pieces- The easiest look to pull off is a menswear inspired jacket. Throw it on over any look and it adds a touch of artsy to your entire outfit. Try a burnt out style in the velvet material, this can come off edgy for a rock and roll vibe. 4) Where did you get those shoes? – If the thought of sporting an all velvet look scares the tripe out of you... then try a pair of gorgeous shoes instead. This way you are dipping your tones in the velvet pond without making a huge commitment. Velvet ankle boots are so cool for this season! I love the idea of darker colours, burgundy, red, green, or even yellow for a true fall staple. By adding this accessory to your outfit you are giving a lush look without being over the top. 5) Save the best for last- I don’t know about you but my favourite time of year is when the new accessories come out for the season. What is the most searched accessory on the web? Handbags of course! I think every girl has a secret bag addiction and can’t help window shopping now and then. Whether you are looking in Zara, Topshop, Chanel, or even Gucci we all do this. From shoulder bags, cross body, totes, and even clutches. 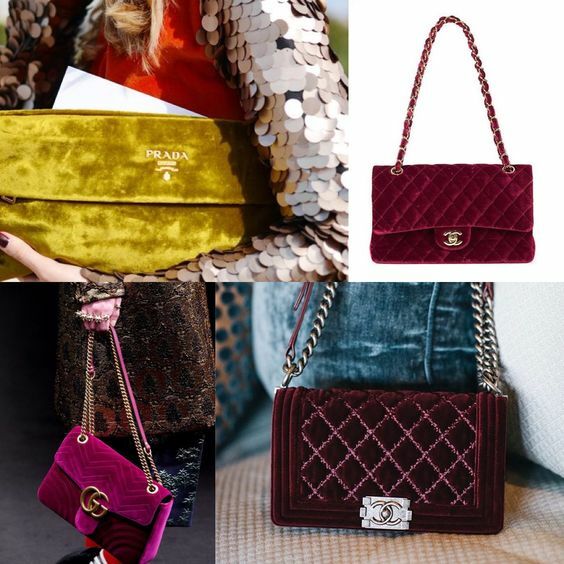 The most beautiful purse in the world is a velvet one! It has versatility, you can wear it during the day with a casual outfit or dress it up come evening. This fabric is captivating our hearts, while making us feel a sense of 90s supermodel nostalgia.